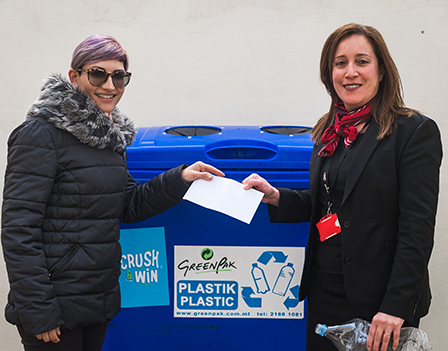 Recycling plastic is important for HSBC Bank Malta and it has introduced GreenPak’s popular Crush & Win Campaign at its Head Office to sensitise employees on the havoc this waste causes to the environment if not properly discarded. The Crush & Win initiative - rolled out for one year as part of the cooperative’s corporate social responsibility - gives out €100 a day to one lucky winner who crushes their plastic containers, writes their telephone number on it and disposes of the item in one of GreenPak’s blue recycling bins across Malta. HSBC has jumped on GreenPak’s bandwagon and set up a blue skip at its Qormi headquarters to encourage employees to dispose of their plastic responsibly. The first winner to be announced is Michelle Azzopardi. “We would like to encourage other big companies and corporations to follow HSBC’s example - every individual and every company has an important role to play in protecting our planet,” Ing. Mario Schembri, GreenPak CEO, said. “Our primary objective is to target littering and reduce the amount of plastic irresponsibly discarded in our environment and oceans”, he added. The bank’s one-month initiative has proved so successful that it is planning on keeping the blue bin on site indefinitely. Anyone can take part in the campaign. For a list of localities where GreenPak bring-in sites can be found, click here.